The protesters made the mistake of walking into the ring. Animal rights activists may want to rethink the idea of confronting pig wrestlers in the heat of action. One such person learned that the hard way Wednesday. 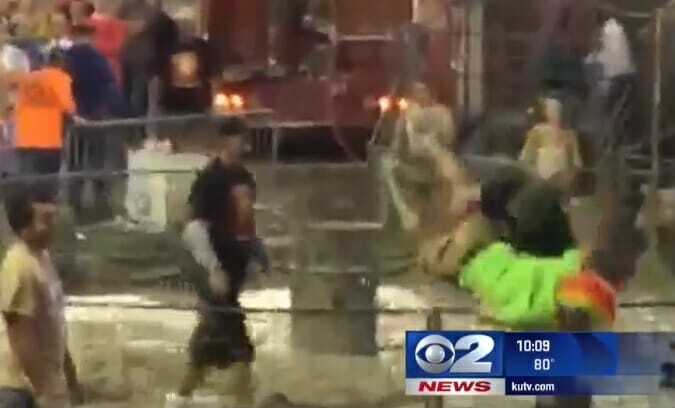 An estimated 2,000 people converged on the Utah County Fair in Spanish Fork to watch the best pig wrestling team be crowned. Participants are as young as five years old. “We were joking about it the other day,” Brody Steele told KUTV. “People were calling us racist animal abusers,” referring to his Confederate flag. The object of the competition is for the team to wrestle the muddy, slippery pig into the barrel in the shortest amount of time. All was going well until a group of protesters in rainbow-colored wigs breached the pen. It’s not clear whether they were looking for a fight or to rescue the slimy pig. Video shows some shoves between the wrestlers and protesters and one who breached the pen being promptly ejected head over heels.